The 2019 KÜRZ TMR 140 brings both outstanding performance and tremendous power to the table. Boasting a strong and very well packed YX140cc Z40 engine, the TMR is perfect for the more experienced riders and those willing to push themselves higher and beyond. 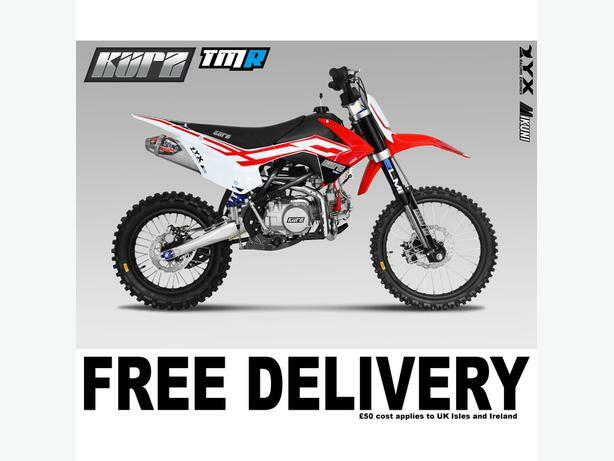 The KÜRZ TMR 140 boasts supreme race specification parts such as the high performance 'ELMI SHOX' front and rear suspension, extended-reinforced swing arm, with the uprated 30mm Mikuni race carburettor the TMR packs a powerful punch and will never disappoint. This bike is the closest thing you'll get to a full size motocrosser, giving you that big bike feeling. ALL BIKES ARE PRICED AS BOXED AND UNMADE. ASSEMBLY IS VERY STRAIGHTFORWARD AND REQUIRES ONLY THE FRONT WHEEL, HANDLEBARS AND REAR SUSPENSION ATTACHING BEFORE USE, PLEASE ALSO GIVE THE BIKE A FULL INSPECTION AND CHECK CHAIN TENSION. No offers please, £875 is the fixed price.